Bella Bella Vita: Dog Lovin' - My Dog Ate Chocolate! Lily gave me quite a scare this past weekend when I discovered she had eaten almost an entire chocolate bar! I had left it on my desk and forgot to shut the door. My husband rushed her to the vet where they had to induce vomiting and give her fluids. I was so relieved when she was ok! Chocolate is toxic due to a class of naturally-occurring alkaloid molecules called methylxanthine containing theobromine, which is similar to caffeine. It is toxic to dogs and other animals because their bodies take a lot longer to digest it than we do. 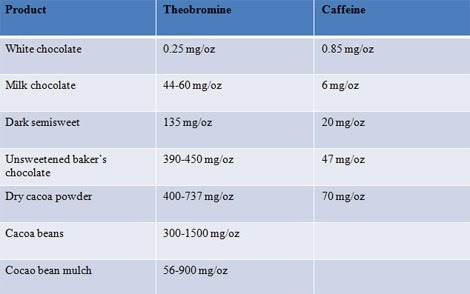 Early signs of Theobromine poisoning include: hyperactivity, vomiting, diarrhea, increased urination, & incontinence. Advanced stages of poisoning include abnormal heart rhythm, seizures and even death. Dark chocolate and Baker's chocolate (approx 10g/kg) are more toxic than milk chocolate (approx 1-5 g/kg). 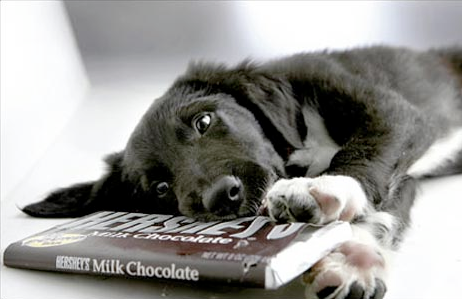 Higher quality chocolates are more toxic than lower quality as they contain more Theobromine.